Six months after taking the reins of New York City's troubled mass transit system, Andy Byford finally met with Mayor Bill de Blasio Tuesday. Andrew Siff reports. Gov. Andrew Cuomo said Thursday New York City should pay half of NYC Transit President Andy Byford’s ambitious plan to fix the subways. The MTA has yet to officially name a price tag for the massive transportation overhaul introduced in May, but it hasn’t disputed estimates in the $37 billion range over the life of the sweeping decade-long modernization improvement project. New York City's delay-ridden subway system would undergo a massive overhaul in a fraction of the time originally estimated for it, with new signaling and new subway cars along with a new fare payment system, according to the “Fast Forward” proposal introduced in late May by Byford. The MTA is NYC Transit's parent agency and would have to decide whether or not it goes forward. After Byford said Tuesday that he’d asked the mayor to help pay for it, Cuomo reiterated Thursday his often-disputed claim that the city owns the subways and is legally obligated to pay. He said that 50-50 is the fair solution. The proposal for the city to pay half is a vast change from the last capital plan when the state paid the vast majority of the MTA capital plan. The size of the captial plan for 2020-2024 has yet to be determined, but the one that is currenlty wrapping up is $33 billion. Though the plan covers Metro North, LIRR and assets outside the city, the governor only expects the city to pay half of the new "Fast Forward" project, which is on the top of the capital plan, officials say. 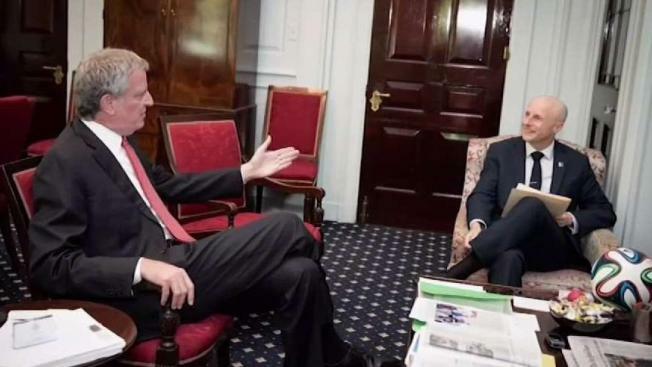 Six months after being named by Cuomo to take over the troubled mass transit system, Byford met with Mayor Bill de Blasio for about 90 minutes Tuesday and spent the “bulk of the meeting” talking about funding. “I pushed him very hard over the need for funding over the next 10 years,” Byford said, but de Blasio contends the state must pay or Byford is powerless. “Until he has a regular money stream, this is all a charade,” de Blasio has previously said.